I am seriously loving my To Do lists, they are helping me stay on top of stuff, I had great success in January, a little wobble in February (due to my health) then great success in march again. Let's hope this month I get the same good results and manage to achieve everything. Spring is truly upon us although I feel like the weather didn't really get the memo, the snow was terrible at the start of March and then we got loads of rain and more snow throughout! I'm keeping my fingers crossed that Aprils weather is much, much better. ● Buy some Flowers - Now I know I had this in my January to do list but there's something about flowers that just makes a home look bright and adds some more aesthetic so I want to get a big bunch of flowers for my room with some great spring colours. ● Get some new Jeans - I really need new jeans.... I feel like the pairs I have just aren't fitting properly around my waist (I love high waist jeans) They still fit over my bum but since I have been loosing some weight they don't feel right in the waist area. ● Clear the rubbish from the house - We seem to horde a hell of a lot of junk so I am making sure we have a big spring clean out, make some more space as I feel it's just all falling on top of us. The plan is to take a day to gut the whole place, clean Leon's old toys out and give them to charity, get rid of rubbish and take it to the recycle centre and just make the house look better. ● Get a new bedding set - Now that it's spring I really want a new bright bedding set to brighten up my room, maybe something with flowers. ● Go a long walk - Depending on the weather I really want to go a long walk with Leon, maybe take a picnic with us and just walk, take the camera and have a great day. ● Make some more plans - I feel like I haven't really been making a big effort with my friends lately due to my health and the weather, I don't like going out when its cold because it always hits me more than I expect which apparently is a symptom of my Fibromyalgia so now that the weather seems to be getting better I want to make some plans with family and friends. ● Sort out my desk area - My desk area is in serious need of a clean out, there's papers and such laying everywhere and it's an area that's getting me down a little I really want to clear it out and make it more organised. A look back at March's To Do List. ● Buy a new eye cream - I actually managed to get an eye cream that works for me which is such an amazing feeling. I have definitely noticed a difference in my under eyes since using it, no more bags! ● Get a pillow sleep spray - I still haven't managed to find a pillow spray... mainly because I haven't been looking much as I keep forgetting but hopefully I'll pick one up soon. ● Drink more water - I have managed to keep on top of drinking water which feels great, I find myself reaching for that now instead of any fizzy drink. ● Have an arts and crafts day one day a week - I started off strong with this one but Leon soon lost interest, he does enjoy arts and crafts but only when he's in the mood for it and he's not been in the mood for it. ● Use my Salon Gift Voucher - I finally used my gift voucher! I booked in for a deep tissue massage & got my eye brows waxed + tinted although I feel the tint didn't actually do much if I'm honest. Oooh, great things to do in April. I agree with the flowers. There's something extra nice about spring flowers too isn't there? What a great to-do list. I'd love to buy fresh flowers but they're really hard to come by in Portugal and I've only found one supermarket that sells them, typically one I'm rarely in! I’m super jealous of the massage! I know what you mean about having fresh flowers in the house. i agree about the flowers, they just brighten up a room, and also my mood! its really fun reading others to do lists :-) I always make mine daily, then the following day the list gets longer as I keep adding all the things I didn't do the day before lol. I do love a good list though, makes me feel productive! It's great you managed to do nearly everything you had planned for March! 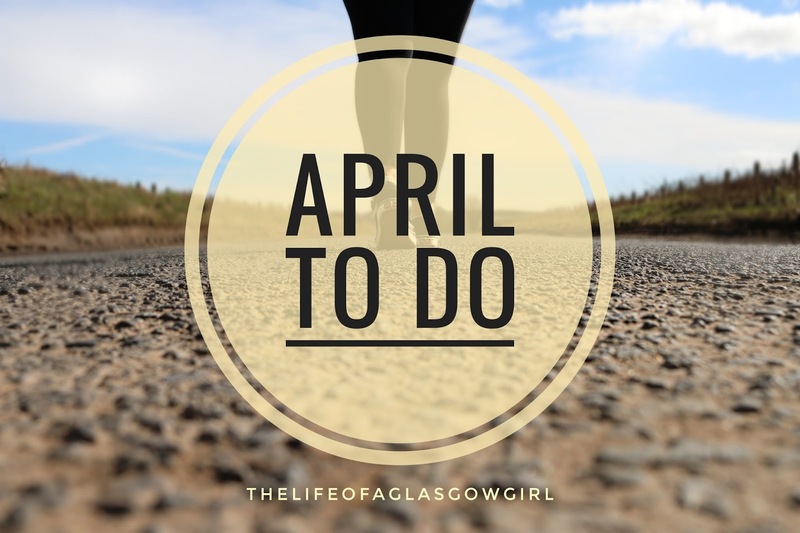 I hope you get to do everything you want to do this month too :) I also have to clear the house out, and I've been buying flowers to decorate the house and it really makes a difference!